Let me describe what has to date been my most dangerous bear encounter, in a lifetime of mostly-safe, even fun, bear encounters. It happened during a hike in late May at Blue Fox Bay, Afognak Island. But first some background. 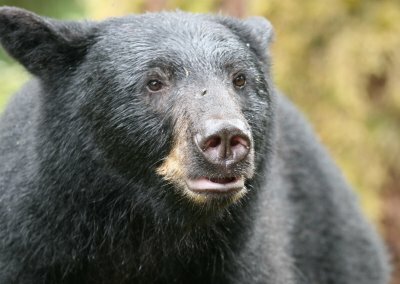 Over the past 40 years I've met bears in many circumstances — on trails, in thick woods where I couldn't see them until I was too close (I once inadvertently stepped on a black bear in thick brush along the Rogue River in Oregon), but mostly at a comfortable distance, for example while visiting Geographic Harbor on the Alaska Peninsula, where one can be assured of seeing plenty of bears by choosing the right time to visit. 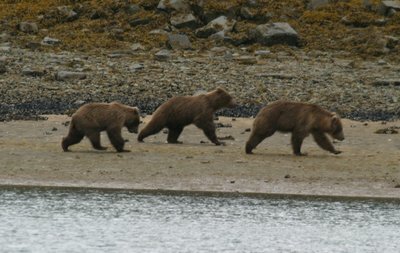 At the height of my bear photography activity I would visit Geographic Harbor, anchor my boat in a sheltered bay bordered by a sandy beach with a population of clams, wait for low tide, and watch as the bears emerged from the brush and tore up the beach for their breakfast. Sometimes I would see 20 bears on the beach at once, all from the safety of my boat, anchored offshore, taking pictures through a long telephoto lens. Perfectly safe. Other times, usually while hiking, I would see a bear or two at a distance. I would wave my arms and yell and the bears would usually take off. Reasonably safe. Some years ago I was sitting on a stump with my camera above a salmon stream in Southeast Alaska, watching maybe 15 bears fishing for salmon. A mama bear and two cubs were directly below me by the stream. Mama had her hands full — she was trying to fish, keep her young cubs from wandering off, and defend them against the many adult male bears also fishing along the stream — that's a lot of work and confusion. In all this activity, from time to time mama bear would look over at me, decide I wasn't a threat, and return to her complicated life. I could see mama bear was becoming increasingly frustrated as a succession of aggressive male bears tried to move in on her — if given a chance they would have killed her cubs and mated with her. By the way, if you haven't seen a mama bear defend her cubs, then you don't know anything about bears. Mama bear took another look at me, then — before I could react — moved to where I was sitting and got in my face. She sniffed me a few times, decided I wasn't a threat, and made her cubs sit down next to me, all within about 30 seconds. Her cubs weren't too happy about being left in the care of this smelly alien creature, but after a final look to confirm I understood her intentions, mama bear returned to her fishing, satisfied that she had solved two of her three problems: her cubs weren't going to wander off, and the male bears (who had been stalked by men with guns) wouldn't dare approach me or her cubs. It was a clever plan, but apart from being fascinated by mama bear's ingenuity I was almost as scared as her cubs. After ten minutes of focused effort mama bear landed a big salmon, sprinted up the rise and collected her cubs. I was free again. The moral of this story? When you visit bear country, you're not in charge. You may think you are, but once a 500-pound bear makes an appearance, you must know how to behave, and good behavior doesn't always work. End of digression — back to the day of too many bears. This season I visited Blue Fox Bay on Afognak Island — it has a decent anchorage and there are a number of nice hikes and kayak paddles. Because of the rainy weather I had skipped some locations in my usual tour and arrived at Blue Fox Bay earlier than normal, in late May. The sun made an appearance, so I planned a combination hike/paddle through an area northwest of the anchorage, a mixture of islands and waterways. I had hiked this area many times and over a period of 15 years had never seen a bear. I knew there were bears in the area — an occasional footprint, a torn-up piece of plastic (bears love plastic things — they playfully tear them to pieces), a pile of crushed deer bones. But I wasn't there to meet bears, I just wanted to hike around, see the country. I should add that the tide was very low — low enough to expose various kinds of marine life bears like eating. About the point at which the beach becomes narrow and rocky (the distant right in the picture above), I spotted a mama brown bear and two cubs foraging in the low-tide exposed area. I stopped for a second, not sure how she would react to seeing a human, but she didn't seem overly annoyed by my presence so I resumed walking. Mama bear watched me as I approached her, not in a particularly aggressive way, but vigilant and watchful. As I got closer I realized she wasn't watching me, but something behind me — something she was actually afraid of. Mama bear rose up on her hind legs to get a better look. Following mama bear's lead I looked over my shoulder, and saw three young bears sprinting along the beach, directly toward me. At this point I'm surrounded by six bears — mama bear and her two cubs, and three young bears who don't have the life experience required to avoid humans, who are running toward me. Because of the speed of the sprinting bears I realize I have just a few seconds to decide what to do. My training kicks in — I turn toward the bears, stand my ground, wave my arms and yell, "Go away!" But this has no effect — these bears are too young, besides until that moment I had been moving away from them, which to a bear is an engraved invitation. As the bears close the distance, I think, "So much for the bear textbook." I had done all the right things, but these bears hadn't read the same book. They were young and reckless — I was a new experience, not an obvious threat, maybe some kind of food. The bears closed in. I didn't have time to make plans but I knew I had to do something. So I started running toward the bears (a completely stupid plan), waving my arms and my hiking staff (look big!) and yelled, "Get off my beach!" as loud as I could. The bears suddenly figured out that I wasn't just another deer or otter, and because I was running toward them the tables had turned and they needed to escape. They abruptly changed direction and made for the brush above the beach. That took care of three of six bears. 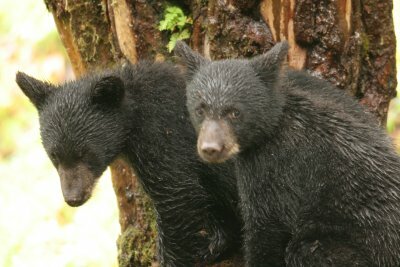 I looked back toward mama bear and her cubs, who remained watchful and clearly unhappy about my presence. Then I looked back toward the young bears now exiting into the brush and saw one more young bear appear at the far end of the beach (about the location of the camera in the beach panorama above). Apparently this was a fourth sibling who had fallen behind his group, but because he was alone he seemed less sure of himself, and when I resumed running and yelling, he sprinted off the beach to join his companions. Think about this — a total of seven bears, approaching from two directions, in an episode lasting no more than two minutes. I carried bear spray, but if the three young bears had gotten to me before I noticed their approach, in particular if they had surrounded me, the bear spray wouldn't have been effective. Was I scared? Honestly, I didn't have time to get scared — my actions were fueled by adrenaline, not fear. The majority of bear encounters involve one bear. Maybe a few more, if it's a mama bear and cubs. And bears don't act in concert like wolves, with one exception — young bears, usually siblings, newly independent, inexperienced, and just as unpredictable as human teenagers. Over the years I've proudly said I've never had a hostile bear encounter and never had to spray a bear. In this encounter I think the young bears were more curious than hostile (not that I would have survived their combined massive curiosity) and the bear spray I always carry might have made the situation worse (I might have ended up spraying myself as well as the bears). But for those Alaskans who argue for a gun over bear spray — a gun would have been completely useless against this many bears, even in the hands of an expert. I want to emphasize that I'm not recommending any of my actions to anyone else. I ran toward the bears (a classic among bad ideas) only because the textbook method (stand your ground, look big) had failed and the bears continued sprinting toward me. 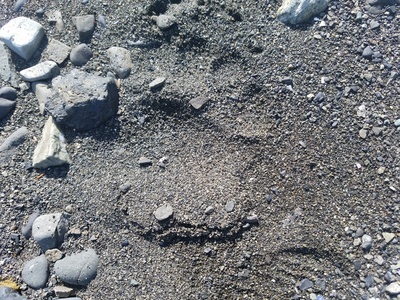 To my infinite regret, I got no pictures, except of the empty beach above and the bear pawprint below (the picture of sibling bears above is a file photo from 2004, taken from a safe distance). By the time I took these pictures, all the bears had taken off including mama bear, who saw me chase the young bears away and decided she wanted no part of me. And I have never sprayed a bear.